We love this tour. We’ve done it twice now, each time with some variation, and we’ve chosen the best parts for you. The tour begins & ends in Bordeaux, a fascinating city that peaked economically in the 18C and retains much of it’s baroque charm. Bordeaux is the center of one of the great wine producing areas in the world, so don’t be surprised that many of our suggestions involve wine & wineries. You could do this tour in a few as 4 nights/5 days, but as you well know, that’s not our style. Here’s our recommendations for a really great bike tour of the region. All of the day trips are fully described on the maps in your bundle. From Bordeaux, it’s mostly dedicated bike lanes, bike path, or back roads to the seductively beautiful medieval village of Saint Emilion where we recommend you spend 3 nights, a day in town to see the village and maybe a winery, then a day trip to a fascinating Gallo-Roman archeological site & then to a beautiful garden. After Saint Emilion, we turn south along backroads to Saint Macaire, a smaller and less visited version of Saint Emilion. Saint Macaire is in the middle of an enchanting area, and there is more to see & do than you’ll be able to fit in. We actually have three day trips to choose from, or if you want to stay that long, you could do them all. After Saint Macaire, there’s some choice. It’s about 105 km from Saint Macaire to Arcachon, the final stop in the tour, and its more or less flat the whole way, so you could theoretically just do that in one go, but that’s way more than we would ever try. A better idea is take to one night in either Villandraut (lots of options for lodging & dinner) Saint Symphorien (one nice B&B about 6 km past the town) or Hostens (one nice B&B an a coupe of restaurants). In any event, stop off in Villandraut if only for lunch and to check out the Chateau. A genuine medieval fortress, very cool. The last stop on this tour is Arcachon. Spend at least three nights here. 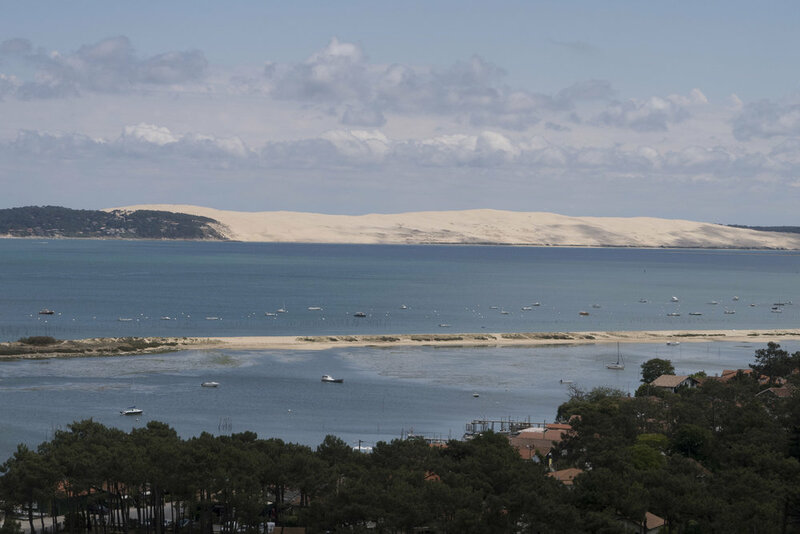 We don’t know why, but we just love Arcachon. It has a beautiful location on the Bay of Arcachon, glorious beaches, outstanding oysters, and all the ambiance of a stately old 19th century beach resort, which it is. The area around the Bay of Arcachon is a cycling paradise. There’s wonderful bike path around the entire basin, and lots to see & do. We have two day rides planned, and you could easily do more if you're so inclined. After Arcachon if you’ve had enough or if you’re just out of time, just take the train back to Bordeaux. We did this the last time. If you prefer to ride back to Bordeaux, take the very nice bike path north up the coast, & spend another night in Lacanau on your way back to Bordeaux. There’s very nice Voie Verte from Lacanau to Bordeaux, then bike lanes in town. That’s 12 or 13 nights, depending on your choice of train or ride back to Bordeaux. Remember that your Maps Bundle contains all the maps you’ll need to follow the tour we’ve suggested, including the day trips. All of the instructions and other useful information are found on the maps themselves. Be sure to read it before you head out!